The SEED Landscape Design philosophy focuses on producing individual, site-specific landscape designs for local and international commercial clients, and residential clients in Brisbane and South East QLD. Each project is undertaken with a dedication that reflects our committed work ethic, attention to detail, and extensive experience to lend improved value and aesthetic appeal to your home and lifestyle. Addressing the property as a whole, we design with the building rather than treating it as a separate identity. This approach aims to increase the living space and extend the internal realm into the external realm, particularly in South East QLD where we live in a warm climate with an alfresco lifestyle. It just makes sense. Contractor recommendation - our recommended contractors are accustomed to the high standard expected when aligned with a SEED Landscape Design project and will deliver accordingly. Design Implementation Consultation - to ensure the investment you have made in the landscape design is implemented as intended SEED Landscape Design offers a post-design service whereby your landscape architect can be on site during the construction phase. This allows SEED Landscape Design to maintain contractor quality, and to ensure construction methods are of industry standard and to the high quality that we expect for our clients. This service also allows SEED Landscape Design to address any unforeseen circumstances that will require a change to the design - we can adjust the design while maintaining the design intent. Landscape Maintenance Recommendation - to protect your investment SEED Landscape Design can recommend a trusted contractor to maintain your landscape design. Alternatively, we can advise on how you can maintain the property with handy tips and advice on such things as when to fertilise, prune, oil deck etc. Ongoing Design Service - as lifestyle requirements change, plants grow/fail, SEED Landscape Design can recommend changes to suit your new requirements. We will always be available to consult and to manipulate your design to adapt to your needs. For our commercial clients, SEED Landscape Design can assist with RiskSmart, Landscape Compliance Certification, concept plans for DA approvals. SEED Landscape Design primarily works within South East QLD shire councils, although we do cover required council submissions for all shire councils throughout Australia. Not only are we familiar with the codes and regulations of the shire councils but we also have the necessary qualification to develop these plans for submissions. For further information on commercial projects please click here and you will be taken to our commercial projects page. 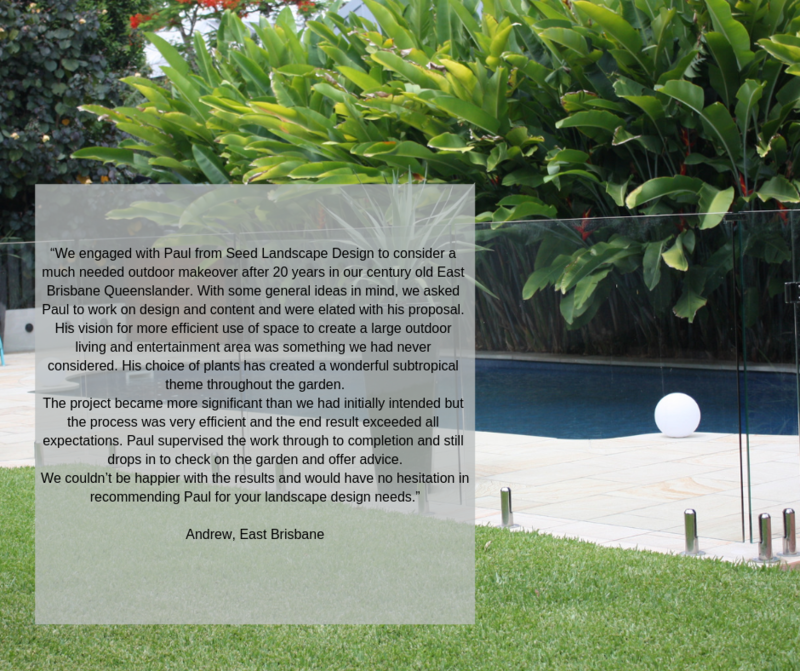 Paul is a registered Landscape Architect and Member of the Australian Institute of Landscape Architecture (AILA). Within AILA, Paul is also a committee member of the QLD Small Business Network (AILASBN). He is also the QLD Director, Membership Committee Director and a board member of the Australian Institute of Landscape Designers and Managers (AILDM). 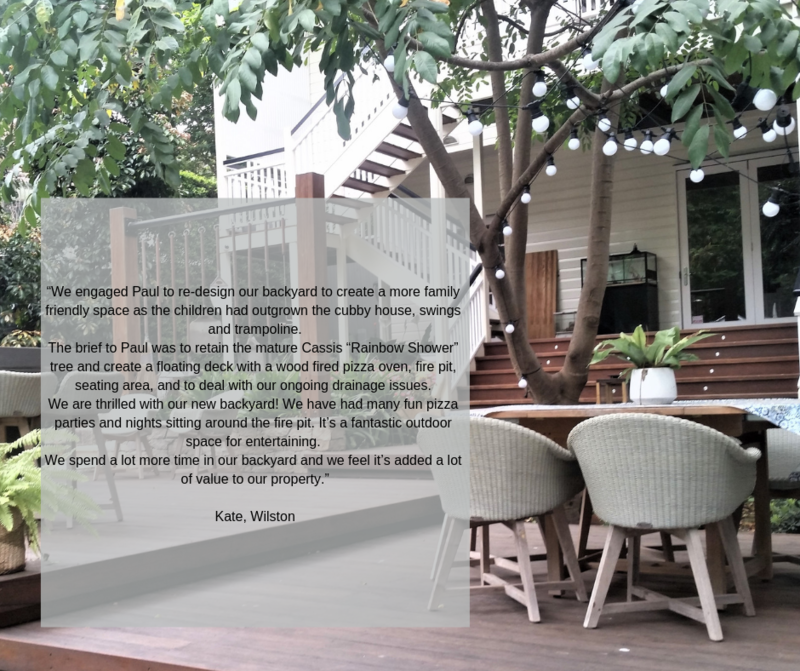 After enjoying employment with some of the larger Landscape Architecture firms in Brisbane, Paul founded SEED Landscape Design in 2005 to merge his design aesthetic with contemporary landscape architecture in the Brisbane, Queensland, area. 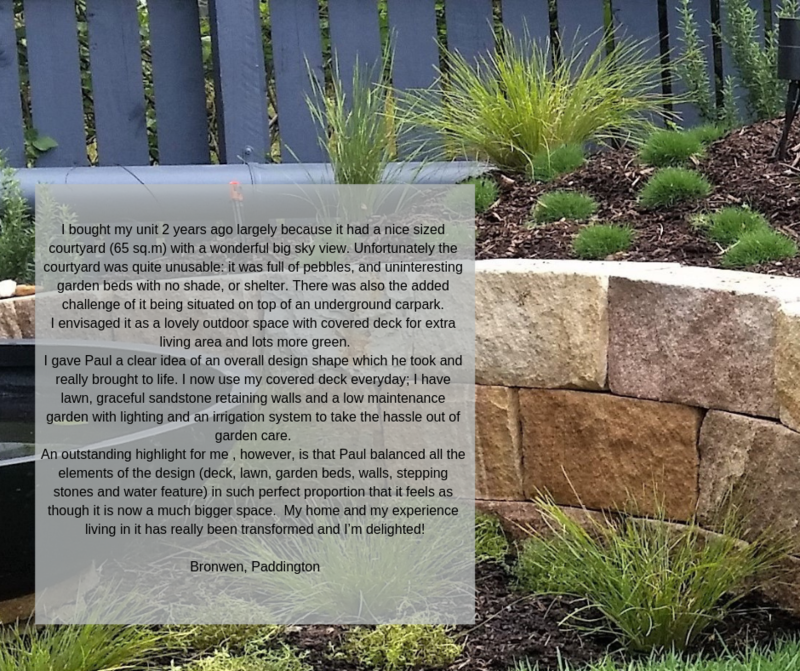 Paul's professional qualifications in landscape architecture, and his design skills, are augmented with practical experience as a Landscape Craftsman for fifteen years in the landscape construction, nursery and garden maintenance industries. With twenty-five years of extensive knowledge of the landscape industry in Australia Paul is a prominent authority in the Landscape Architecture and Design industry. To assist in the delivery of Seed Landscape Design’s services, we maintain industry knowledge in current landscaping styles and current legal compliance requirements across multiple shire council jurisdictions. We consult closely with commercial and residential clients to ensure a successful and inspirational outcome that meets the client’s original intent. As a landscape architect service Seed Landscape Design is qualified to meet multiple shire council landscape compliance certification requirements. Australia is home to some of the most unique, native flora and fauna. As such, Seed Landscape Design strives to promote regeneration and care of this unique environment. Seed Landscape prioritises the use of native plants and trees to encourage a balanced ecosystem, providing safe harbour for native animals. Consideration of soil erosion, water conservation, noise and visual pollution, and sustainability is paramount in any Seed Landscape Design project. The Principal of Seed Landscape Design, Paul Stein, is a registered Landscape Architect and a member of AILA, the Australian Institute of Landscape Architects. Paul is a member of the committee for AILA’s small business network. Paul is also a member of AILDM, the Australian Institute of Landscape Designers and Management Professionals, where he is the Membership Committee Director and QLD Director on the AILDM National Board.